Last week down BIG George came up with a cunning idea of playing a NWF colonial game using Rebels and Patriots rather than The Men Who Would Be Kings, partly, as we had both concluded the latter was more suited to the 1870's to '90's colonial form of warfare and we both have a hankering to do the Indian Mutiny and First Afghan War, and also just to see how differently they played given their common heritage. 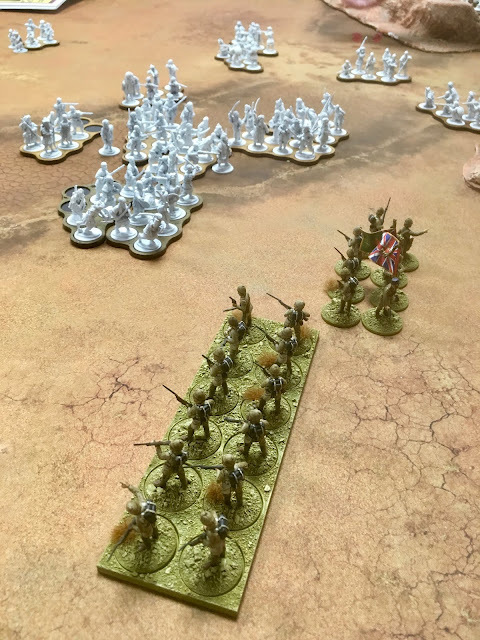 For the British I went with three units of Light Infantry, upgraded to Good Shooters and Aggressive and a unit of Light Cavalry upgraded to Veteran, Good Shooters and Aggressive. For his Afghans George split his force between Skirmishers and Natives beefed up into Large units (18 figures from 12). We picked the It's Awfully Quiet Out There... scenario from Kings but both had 36 point forces. As it was more a test of the rules than anything else I didn't take as many photos as normal. My battle plan was to try and get my force into the near right corner and then shoot the advancing Afghans down. The first thing we noticed was that Rebels was not as bloody as Kings as you need to roll more hits to inflict a casualty. 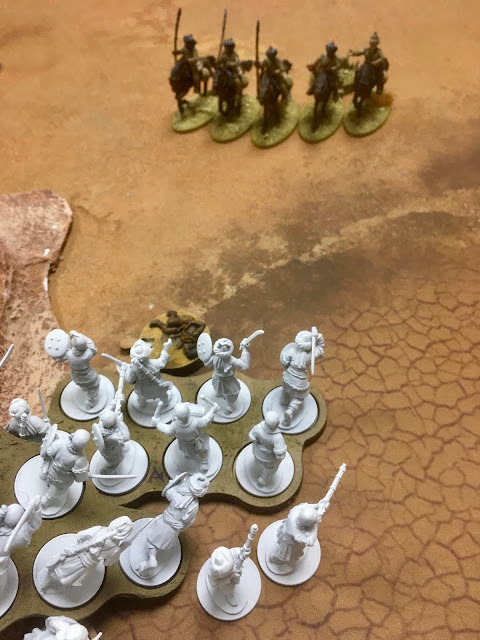 In the picture below the British would need to roll one hit to kill an Afghan in Kings, whereas in Rebels it was three (standard two plus one as Skirmishers count Open Ground as Cover). This made a huge difference to play as the British were less susceptible to losing one man and getting Pinned (effectively neutralising them for at least one turn) as with Kings. In Rebels Pinning is replaced with Disorder and whilst similar it does allow a unit with one Disorder maker to take action even if not as effectively as when not Disordered. 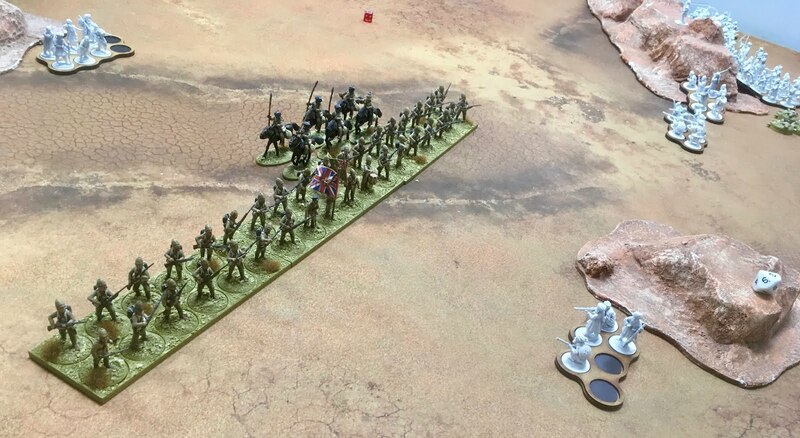 Having a unit of Light Cavalry I decided to be a bit reckless with them to see how cavalry work in the game and how effective they were. Initially I tried to Charge a unit of Skirmishers but they used the Evade rule and moved out of range having managed to loose a round of gunfire at my Cavalry killing one. 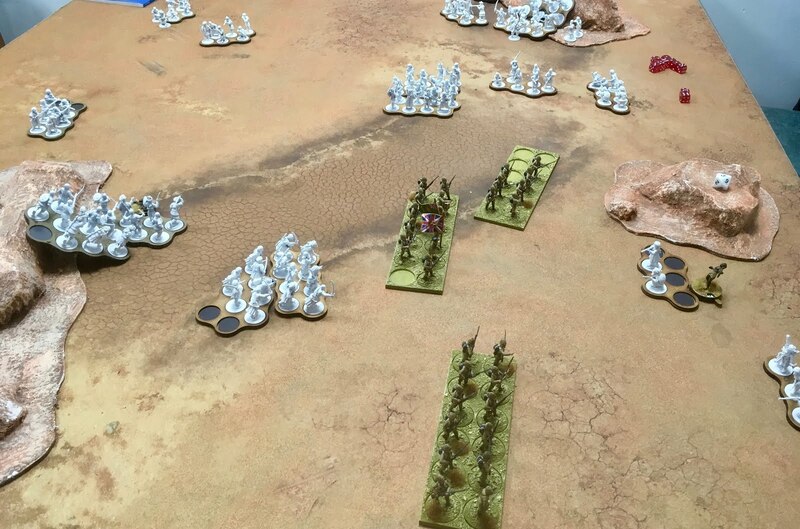 George then charged them with a Large unit of Natives only to be beaten back with both units ending up as Disordered. It took a little while to get used to the differences in the rules as we kept checking the rulebook to make sure we were playing the right game! 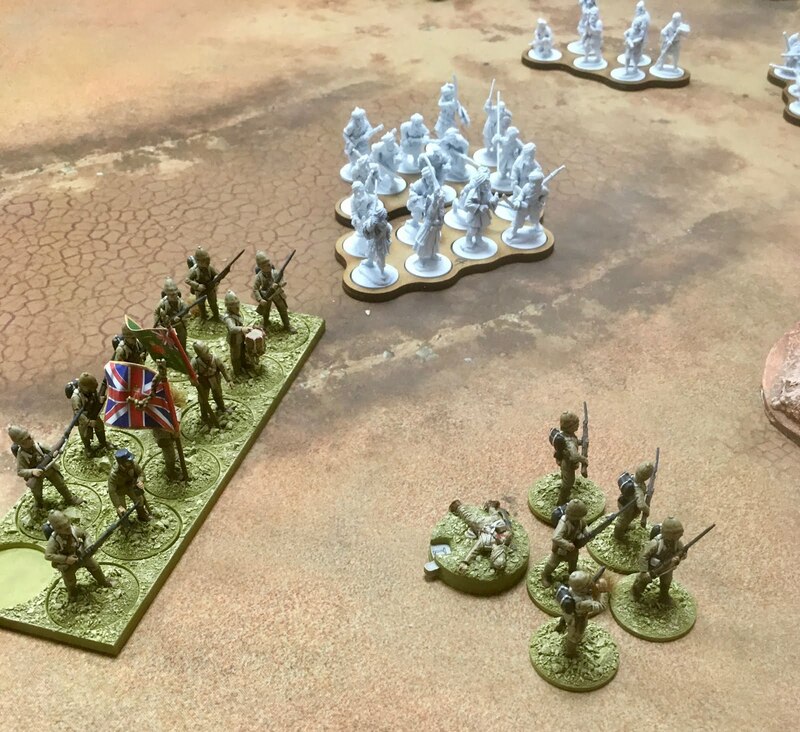 George quickly got a grip on some of the changes, concentrating his fire on one of my Light Infantry and reducing it below 50% and thus giving it a permanent Disorder marker. As a test I think we both found it to be an enjoyable game, very different from The Men Who Would Be Kings despite their common heritage, and for Colonial games prior to 1860 probably a better choice. You could just downgrade the weapons in TMWWBK’s? Good idea. Interesting experiment and we'll worth a try. Thanks for the Battle Report - Great idea.